The morons over at Shura al Mujahideen fee Junubu Afarika (South Africa) are all a-twitter over their “brother” Jose’s arrest on terrorism charges and the implications it might — and should — have for muslims “speaking the truth” on social networking forums. Of course the well-documented transgressions committed by poor ol’ Jose are all false. *insert ginormous eye roll here. * Of COURSE they are always innocent! LOL! As a result they are looking to “infiltrate” and “keep an eye on” anyone who is countering their BS – specifically mentioning Internet Hagannah and Operation YouTube Smackdown. When they gather information on the supporters of the mujahideen, be it about their youtube channels and friends, blogger profiles and blogs or their facebook accounts, they share it among themselves by posting it on their forum (forum.internet-haganah.com). If any brother or sister is to come across this, make sure that you inform those who are being spied on so they may delete their accounts and start up new ones or at least so they may be more cautious. Oh nooooooes! They are gonna watch us! Run for the hills! Hey boneheads – if we didn’t want you to see it, you wouldn’t know it was there — just sayin’! Funny that they are all worried about the implications of the arrest. Probably because they are guilty of promoting terrorism at their site as well. And who do you think helps them out? Yep! You got it! Google/YouTube. Their blog is on Blogger — the free Google blogsite. Not surprisingly, it’s a video hosted at none other that YouTube. And yes – you can see on the statistics for the video that it was unloaded on 11/26/11 and embedded on 11/28/11. You can also see the search topics by which people using YouTube found the video — which means that presumably YouTube/Google should be able to use their own search filters to find it as well. And if they were truly serious about removing terrorist videos from YouTube, they would. The hypocrisy is stunning! 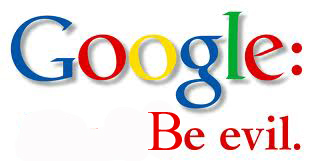 Google really needs to change their slogan. Terrorist loving rich white trash Zachie-boy is upset because *gasp* YouTube removed terrorist videos, after which YouTube reveals just how far they have their collective heads stuck up their own butts. YouTub[sp] senior official Victoria Grand told the participants of the international conference about the latest scandalous story on this issue. It was about the video statement of the Caucasus Emirate’s Emir Dokku Umarov, which was posted on the portal after the sabotage operations in the Moscow subway. After this statement was seen in 3 days by more than 600 thousand people, YouTube removed it from its server. Victoria Grand explained what happened in this way. “It was really a difficult decision and we had a lot of internal debates on this topic. Moreover, it was the material being showed on news channels, so, it had a news value. But Russian authorities took a tough stance on this issue and said that it is almost outside the law“, said Grand. As a result, according to Ms Grand, YouTube decided to remove this particular video material. However, at the same time, she stressed that this does not mean that there are no other versions of this video statement of Dokku Umarov on YouTube. “You can still find on YouTube a lot of materials of this kind, such as a video from training camp of Taliban, and no one removed this video. Everything always depends on context” Grand summed up. Well let’s see, Victoria. Just what context would make it appropriate for YouTube to continue hosting videos for terrorists so that they might recruit and propagandize in order to kill more people like you? I’m really just wondering about that. I can’t believe how freaking ignorant these people are! Do they really believe that the sharia-law loving terrorists are going to allow them to continue with free speech if they gain control of the west, which is what all those terrorist propaganda videos are there for? Wake the hell up!!! JihadTube, the go to site for terrorist propaganda. BIG H/T to David who posted this video in the comments on the Reporting Terrorism post. I am reposting it as it’s own post, so it will appear on my page. The YouTube Partner Program is intended for users who want to generate revenue from their existing audience. If you are more interested in increasing your audience, you may want to start with the YouTube Promoted Videos program first. Well, that certainly clears a lot up. I guess that explains why at least two users have received strikes against their accounts for this DoD video which they uploaded to their channels . The video shows our U.S. military exercising restraint while watching a terrorist assemble an IED, only to see the terrorist blow himself to hell. The user linked here was given a strike, but upon appeal it was removed and the video was reinstated. No clue on why the other two users didn’t get their videos reinstated. The same guy who approved the terrorist fundraiser as a YouTube partner must have reviewed their videos. What is demonstrated is that YouTube would rather bend over backwards and kiss the backsides of terrorists and terrorist wannabes than to stand in solidarity with the coalition forces. Thanks for the clarity, YouTube. Not that we are surprised in the least. Jack addressed the fact that an increasing amount of Americans are being recuited by terrorists to train in countries such as Pakistan. The internet is playing a major role is recruitment – just take a look at ‘Jihad Jane’. But really, isn’t it more than that? It would have been helpful for the interview to continue with information on what to do if you think that you have information on a terrorist or terrorist-to-be. There are steps here and here for what to do with information you may have. Notify local police. Notify the FBI. Notify Homeland Security. These agencies are trained and sometimes your piece of the puzzle may seem insignificant, but added together with other pieces a true picture may emerge. It’s going to take more than simply “watching” what’s going on – you need to act. Well, yesterday, yet another YouTuber was arrested. This time is was Norman Leboon, Sr. for threatening to kill Eric Cantor, the Virginia Congressman. Norman Leboon, 38, of the 1600 block of Benner Street in Mayfair, was charged by the U.S. Attorney’s Office in Philadelphia with two counts involving threats against U.S. Rep. Eric Cantor, the Republican House whip. Leboon was arrested Saturday by the FBI, three days after his YouTube video was seen by someone in San Francisco and reported to the FBI. Well how about that? Someone posted threats on YouTube? Say it isn’t so! The funny (or not so funny) thing is that it’s just possible that the FBI ignored Leboon’s brother’s reporting on his brother because, well, threats are nothing new at YouTube. They are everywhere. And then there are the backgrounds that people put on their channels, which are a whole other story. The point is, YouTube turns a blind eye every day to the hatred and violence and threats and thereby hosts a culture of threats and violence. How many true believer whackjobs like Colleen LaRose, Normal Leboon or Nidal Hassan is it going to take for YouTube to own their responsibility? Yeah — it’s rhetorical. The answer is, most likely never. A friend has come up with another way to hold Google/YouTube’s feet to the fire though, and it is ingenious. Google and YouTube have advertisers. I doubt those advertisers would be happy to see their ads on pages that advocate things like killing U.S. Congressmen or wiping out the Jews. Maybe a hit in the pocketbook is the cattleprod we need to wake up Google/YouTube. All hands on deck – let’s roll! Related Jawas post – heh! Updated — check out THIS version of OPEN SEASON! Whoa! Hat Tip to RW — thanks! Was Jose Pimentel a YouTube User?